We swing our arms to the music – pendulum fashion, and then stop and listen. Ali quotes Nancy Stark-Smith, a pioneer of Contact Improvisation that there is gap between engagement and non-engagement when dancing at a jam. 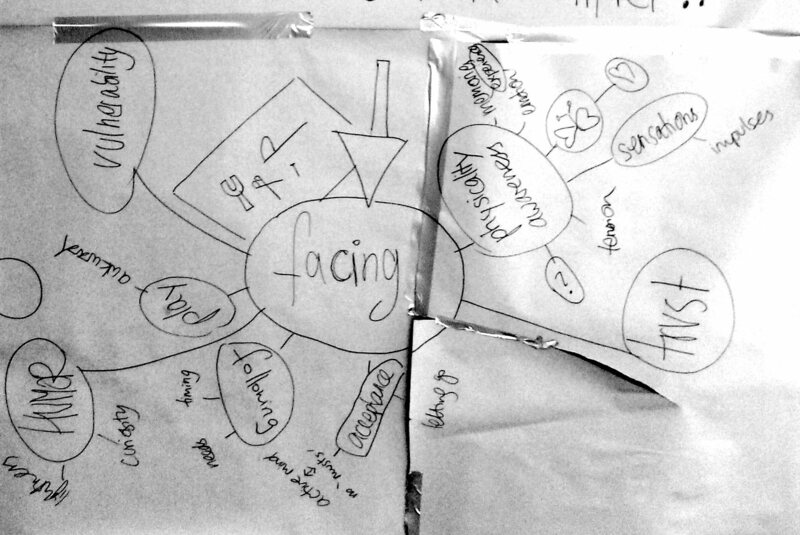 Ali talks, and explores this by drawing wall charts – a lecture. 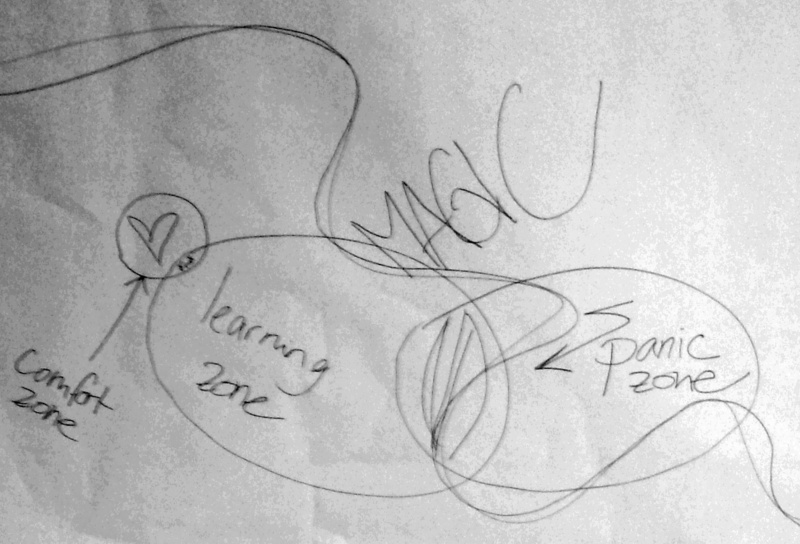 The gap is that space between the learning zone and panic space, Ali suggests. What are the choices facing us in the gap? ‘Yes’ & ‘No’ We move in the space and approach people – at the point of meeting and facing them we must say ‘yes’ or ‘no’ and then dance or not dance with them. It’s confrontational, and there’s rejection, relief and celebration. Intimacy We stand with a partner, eyes closed, facing them. Opening the eyes, we must engage with act of intimacy which could be touching their head or hair or hand. Or maybe dancing with our hands and arms for example. Statues Twelve of the people in the workshop take part in a improvised performance which we are to analyse from the perspective of being the audience or performers. Of the twelve then four must stand motionless in the performance while the others move and do whatever they like. There’s lots of attention for one motionless man who is teased by the others – he confidently volunteered when it came to choosing people. Others dance separately – in duets or trios; one person is carried between people. Blindfolds Another set of twelve people perform – including me. Four people are blindfolded, and the remainder are not blindfolded. We must perform together – it’s improvised and again – we can do ANYTHING. The non-blindfolded people – including me – track the blindfolded people and ‘protect’ them from harm. 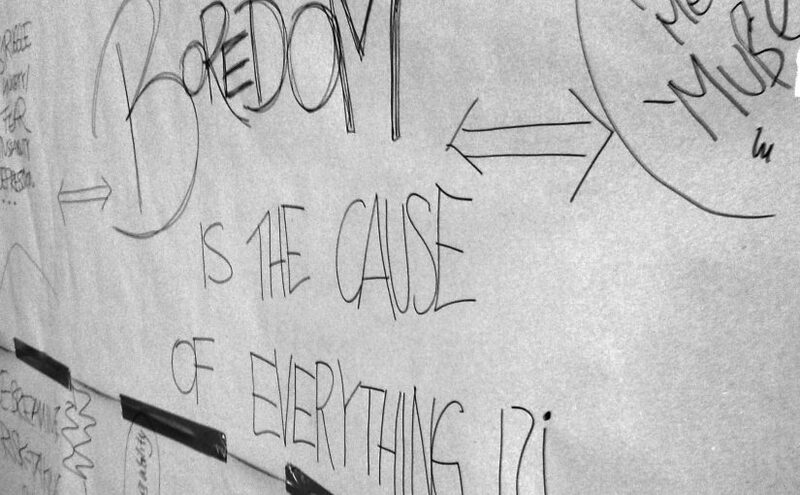 We are timid and there’s little innovation – we definitely don’t do ANYTHING. The audience watches the performers; the non-blindfolded performers watch the blindfolded people. Afterwards, the blindfolded people say they felt free. I notice that the blindfolded people couldn’t see if those with which they interact, are blindfolded or not. Black-box We create a box with an open side. The box is formed by standing with our backs to the interior – thus we’re creating the ‘walls’. We can enter the box and do whatever we like but we must maintain the box. I stand as the wall and I don’t enter the box space – someone has to keep the space! Besides, I can see through the studio door – it has a glass window – to outside in the corridor and people have gathered outside; we play – signaling, they pressing their faces to the glass window, we blow kisses. That’s cheating says Ali. We end with feedback and discussion. Although the opportunity arose in our performances, we didn’t do ‘anything’ but mostly danced! The gap it seems, is a very small one.